The Spike's Tactical Lower - Standard Parts Kit exceeds military specifications by a long shot while also offering a much better fit and finish. This is NOT a rebranded DPMS or Stag LPK; this kit is all Spike s Tactical and it's a perfect way to complete your stripped lower. 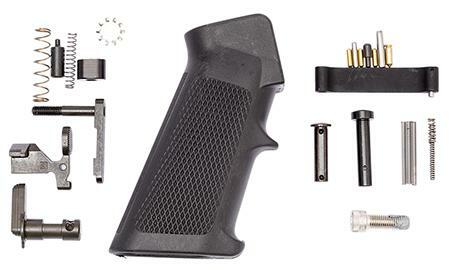 It includes: rounded hammer (works with ALL calibers), hammer spring, trigger, trigger spring, disconnector, disconnector spring, safety selector, detent, selector spring, bolt catch, bolt spring, roll pin, plunger, magazine catch, catch spring, catch button, front pivot pin, rear takedown pin, aluminum trigger guard with spring loaded detent and roll pin, buffer retainer spring and plunger, A2 Pistol grip, 1/4x28" hex screw, star lock washer, and stainless hammer and trigger pin with Black Oxide finish.